Often when we are talking with customers about FlexRule’s Process Robotics and Decision Automation they pose the problem of garbage in, garbage out. That is, what if the data we are feeding into the process and decision flow has errors in the first place? They tell us this is usually caused by their sales team not filling in the order form or the CRM system correctly. Or the fact that they have multiple systems with varying information that is supposed to be the same; customer addresses, account numbers, product descriptions, etc. By the way this is a fact of life. The world is not perfect and there will always be garbage in. More on this later but FlexRule can even help you find out who the culprit is or which systems are causing the errors. To solve this data garbage in garbage out problem, we ask them how do they know the input data is incorrect? In response, they usually tell us that they manually validate the data either through cross referencing files or having people use spread sheets to confirm the details. This is followed by manual corrections and updates. You can almost see the light bulb go off when we say that what they have just described is a pre-step in the flow of FlexRule’s Process Robotics and Decision Automation. The manual checks are rules, what to do to correct the data is a decision and this is all part of the end to end process. 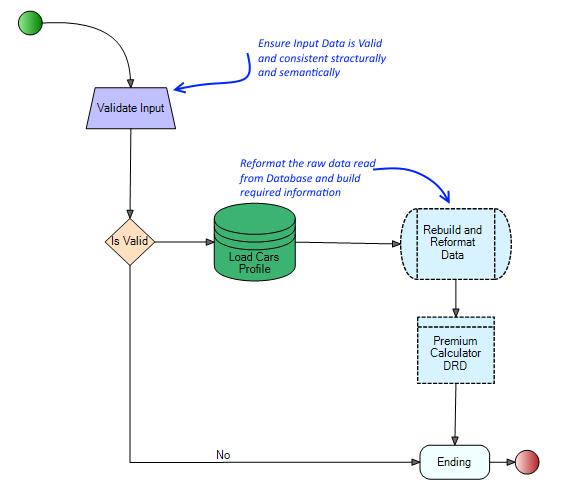 Sample process flow that validates input data after receiving and do a post-process on the database raw data to reformat and create something useful for decision making. This validation pre-step could be error messages being sent back to the input application, rules deciding which data to accept, data composition actions to correct the errors or reformatting the data such as separating out first and last names. 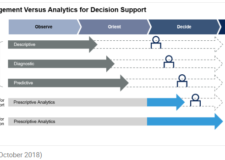 Sometimes we still need a person to decide what to do about an error in the data. This process step expands the requirements to human workflow. 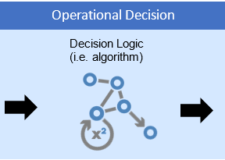 This is where the process is paused and a request is sent to the right person, selected through another decision process, to correct the data. FlexRule’s Process Robotics is able to implement human workflow and manage long running transactions of this type. 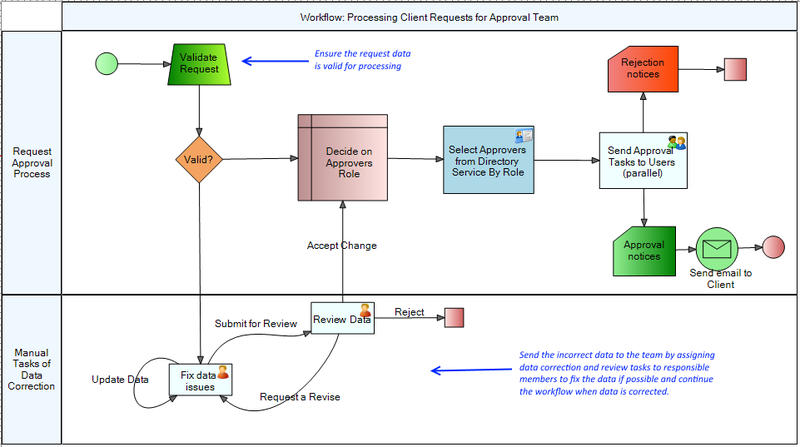 A sample Workflow of processing client requests. This workflow has two part, main part, for processing valid requests. Data Correction part, that assign tasks to responsible roles to correct and review the request data, and continue if possible. Having solved the data garbage in, garbage out problem within our customer’s company, a further problem scenario is often proposed. This is where the data is coming from a third-party company. It could be a partner, reseller or customer. Our customer has no control over the input data and a common concern is over sharing data and privacy. Chances are that the third-party company has the same data garbage in, garbage out problem as our customers. 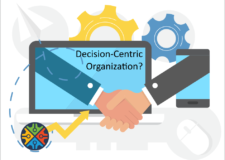 Therefore, as part of the same project (please read no additional license fees), you can build your partner, reseller or customer their own FlexRule Process Robotics and Decision Automation flow to collect, validate, correct, de-identify and share only the data the third-party wants to share. An alternative is to switch the flow of data. Have the third-party partner, reseller or customer FlexRule Process Robotics and Decision Automation flow to first accept data from our customer’s company. This is now processed on the third-party’s side and only the results sent back to our customer. Finally, we can also help everyone, our customers and the third parties, find out who, where or what is the source of the garbage in. With FlexRule’s traceability and explain-ability audit tracking reports can be generated that trace the garbage in back to the source. These systemic issues can be fixed to not only help solve our garbage in, garbage out, problem but also to remove errors for other systems that rely on the same data. Garbage in will always be with us but with FlexRule you can think of this as just another step in the Process Robotics and Decision Automation flow.